In General, tis NOT the season for Christmas cards, but one of the sneak peek items available to demonstrators this month was this great designer series paper called Be of Good Cheer. Not being a huge fan of the holiday offerings in the past, I have to say that this one is a winner in my book! Lots of simple patterns that are great for cards! 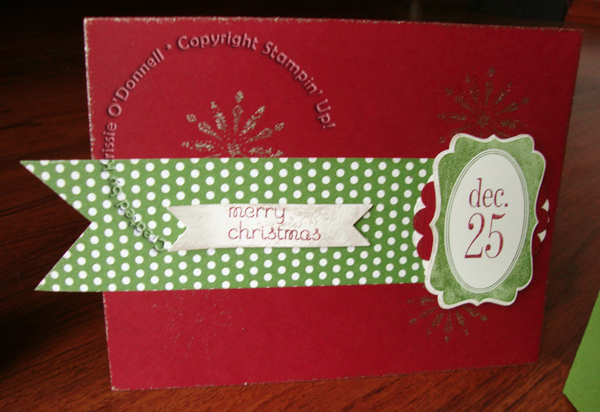 This card also uses Snow Swirled, Tags til Christmas, Champagne Shimmer paint and the colors are Cherry Cobbler and the new In-color Gumball Green! Oh, and that banner? It was cut with a new framelit collection called bitty banners. Look for all this new stuff (and returning stuff) in the catalog in June.